Have you seen him conducting his debate on "Newshour"? He tries to question politicians' principles. For example on Laloo - Nitish's reunion , he asks JD-U partymen - "You were criticizing Laloo till a few months back . Now how can you join hands?" It is good for starting a debate but focusing the whole debate around that question is very naive. Finding principles in politicians actions - that is childish. His questions should be more mature I think. Arnab has become a legend .. some of his tirades are well captured by the spoof industry. There are quite a few fake twitter handles for him, and his trademark "Nation demands an answer" is world famous in India. i had access to times now breifly. 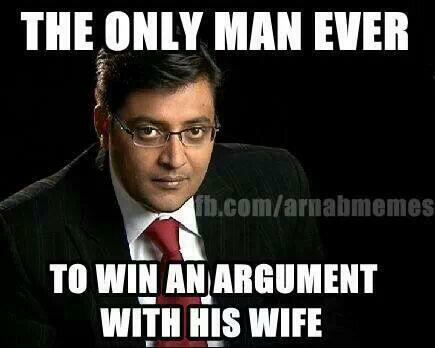 every time i tuned in, Arnab goswami was shouting or there were ads of him. Mumbai. A 35 year old man suffering from low blood pressure was today prescribed daily dose of Arnab’s Newshour on Times Now by his doctor. The doctor reportedly took this decision when even after 6 months of a regular high dosage medication failed to normalize the blood pressure of the patient. “We tried lots of things. We gave him most advanced and concentrated form of medicines. We even showed him Dhoni’s last ball chases where he deliberately wastes time, but nothing worked,” the doctor’s compounder told Faking News. Sufficient to increase your BP by few notches. The doctor who is regularly visited be high profile patient then suddenly realized that he has lots of High BP patients thanks to Newshour. “Almost all your regular panellists on the show are patients of high blood pressure. They regularly consult or call me after they have participated. Not only this, many of the regular viewers of the show too have high BP,” the doctor revealed. However for instant results, doctor has advised patient to watch debates featuring Sanjay Jha. “For some reason if the unnecessarily high tempers, heated and loud atmosphere on the show, doesn’t help in increasing the BP, I am quite sure the arguments of Sanjay Jha and his standard response of ‘Arnab let me answer very quickly that in 2002 Gujarat riots’ to anything that is asked, will surely excite the patient,” doctor said confidently. “And if even that doesn’t help, then I will be trying through my contacts in media industry to somehow get him as a panellist on the show itself. If not watching, participating will surely cure him,” the doctor added. Although the medication looks entirely natural , doctor however warned of a mild headache as a side effect. found something related to this thread..
Do we really need to watch parody of one of the best comedy show on Indian television? Ok serious ... Arnab Goswami has god-gifted knack for exposing so-called experts for what they really are like. Former CM and now PM Modi is one of very few who escaped Arnab's show unscathed with dignity intact. He has god-gifted knack of getting exposed himself as well. It seems you already know that but examples will be presented on demand. Lots of Qtiyapa clips on fake Arnab is rather more interesting,..
YT search for Qtiyapa of arnab with ranbeer singh, Ali zafar and SRK for HNY movie,.. they were hilarious. Arnab’s interview with Raj thackere was I liked the most,…. As Raj had made his bakari beinnn,.. ! Thackreys only can take care of loud fart arse shouting Arnab,..
Last interview before the election of Modi with arnab was interesting,. As on few occasions,.. Modi had made him STFU ! Now what will Arnab bark? Fixed judges? There are a long list of people Arnab needs to apologize to.